The Pyramidion is one of the better Nightfalls in Destiny 2 and certainly one which SOLO players can revel in. This guide provides a SOLO walkthrough for the Pyramidion Nightfall with coverage on modifiers, weapons, classes and general strategy. IO is the destination for the Pyramidion Nightfall. It's one of Jupiter's moons that's plagued by Vex. The Nightfall also has a large selection of Taken to cause some frustration, especially from snipers perched on top of pillars. There are some minor sections that can be skipped and the laser puzzles provide some variety halfway through. If the modifiers are in your favour, i.e. Torrent and Zero Hour, it's even possible to SOLO the Prestige version of the Nightfall using the same strategy but with a touch more caution. At the end of the day, with Torrent active this Nightfall is one of the most entertaining in the Destiny 2 collection. 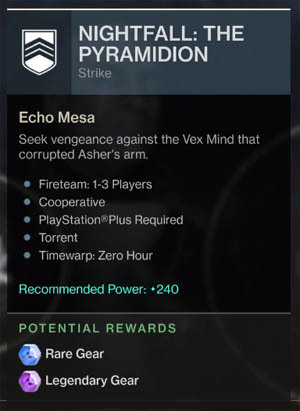 At the time of writing (Rotation 1), also the first time Pyramidion has appeared in the Nightfall rotation, the weekly modifiers are Torrent and Timewarp Zero Hour. These may change on later rotations (after week 3) and the guide will be updated as appropriate. Torrent is an excellent modifier for SOLO players, providing stupidly fast recharge rates for abilities. This means that grenades and special abilities such as Rift, Barricade etc. can be used more often. With Torrent as an active modifier, players can be super aggressive, spamming grenades, class abilities and Super's throughout the entire strike. Unlike the other timer "boosting" modifiers of Anomalies and Rings, Zero Hour basically means NO extending the timer. There are absolutely no top ups but you do have the luxury of an already extended timer of 22 mins when you start the Nightfall. Once again, this modifier falls perfectly into the hands of SOLO players who can spend less time worrying about topping up the timer and more time pushing past the enemy. Personally I think that 22 mins is a generous extension, not far from the cumulative effect of getting all of the rings or anomalies. Attacks matching the active burn element deal more damage. Kill enemies to top-up the timer clock. If both Torrent and Zero Hour are active, the strike turns into an aggressive and easy to finish race where usually the best grenades and class abilities prosper. Be bolder with class choice, opting for the most effective grenades and aggressive skill paths. There's no one class that rules them all here so it's a good time to pick your favourite. Most of you will have come to love the Voidwalker's Attunement of Hunger skill path by now, especially after seeing the Attrition modifiers harmful effects on shield regeneration. However, now is the time to switch over to the Stormcaller subclass and enjoy the benefits of Pulse grenades and the Attunement of Conduction skill path. Arc Pulse grenades combined with the Arc Web skill, which provides chain lighting affects following grenade damage, are the perfect match for the Torrent modifier. For Titan's the Striker subclass has an excellent grenade choice when Torrent is active. Pulse lightning grenades provide the most effective grenade attack in Destiny 2, with strong damage and a good spread to compensate any inaccurate throws or enemy movement. Combine this with the Code of the Earthshaker skill path and you'll have two grenades at your disposal thanks to the Magnitude perk. Barricade is still a SOLO players best friend and once again this ability is perfect for the final BOSS fight. For Hunters, there's some sneaky fun to be had through the Nightstalker subclass when Torrent is active. With such a fast recharge rate, Hunters can continuously hide under Smoke Grenades throughout the Nightfall. This is particularly effective for the early and middle parts of the strike when you must hold the plates but it's wise to switch grenade types during the final BOSS fight. If Prism is active, ensure that you balance your class type with the weapons you carry. 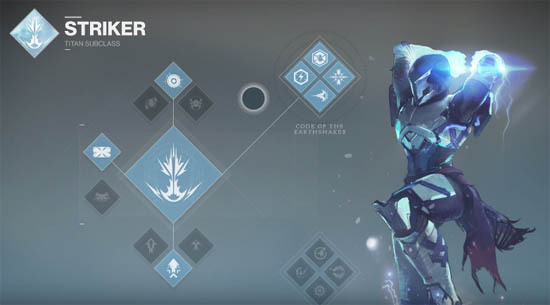 For example, if choosing the Stormcaller Warlock with Arc abilities, balance your Energy and Power weapons for Solar and Void. This will allow you to switch attack types as the Prism modifier rotates. When Torrent is active, weapon choice becomes less important and it's more about armour and mods. So let's keep the weapon recap short as I've covered this a few times already, and focus on armour instead. My best weapon advice is to keep a good Rocket Launcher to hand. There will be plenty of Power Ammo drops in this Nightfall and you'll often be using the Power Weapon more than your Kinetic primary. When Prism is active, your primary focus should be balancing damage types through your Energy, Power and class abilities so you can follow the Prism damage type rotation, always attacking with the matching Prism burn. Substitute any of the weapons above, with the aim of having any of the well approved mods e.g. Cluster Bombs, Damage Multipliers, Area of Effect etc. I have found that auto-tracking missiles on Rocket Launchers are also great for hitting those Hobgoblins perched on top of pillars. Generally speaking you want to avoid Pulse Rifles and Grenade Launchers until patched. There's also little need for swords or shotguns in this strike. As for armour, well this is more important. Whilst weapons have little effect on your abilities, armour comes with perks and mods that play straight into the hands of your class. Look for mods or even exotics that will further increase your grenade recharge rates. A good example is Hallowfire Heart for Titans which improves your Solar grenade recharge rate. Furthermore, attach mods to your Legendary armour pieces to improve the recharge rate of your favourite grenade type: Arc, Solar or Void. With the right choice of exotic Armour and mods you can easily get the grenade recharge rate down to 2-3 seconds. Use your sparrow to quickly reach the entrance to the Pyramidion. Clear the area and begin standing on one of the two circular plates. Remain in the circle until the plate is fully charged, before moving onto the second plate and repeating the process. Enemies spawn in set locations so look out for the blue lights and start throwing grenades before they spawn in. Warlocks pop continous Rifts here and Titan's you can place barricades constantly while you charge the plates. With a good recharge speed you can even place two barricades at a time. Hunters with smoke bombs, use these continuously to stay completely invisible and speed through the plate charging. Once both plates are charged the objective changes to Defeat the Vex so simply clear the room to continue. Tip: No matter which class you are, a great strategy for this section is to stand behind pillars (out of direct line of sight), then double jump vertically and throw your grenade at the peak of the jump. Enemies are pretty useless at targeting you whilst jumping and you'll immediately fall back down behind the pillar to safety. Continuously repeat this jump/throw grenade process and the room is clear in no time at all. Aim to have around 19-20 mins on the clock at the end of this section. Hop on your sparrow again and skip through the next two sections as you speed down the giant stepping stones and continuing running through the laser puzzle section until you reach the "Defeat the Taken" objective. Now onto the first annoying Taken section which starts with Hive Knights and a few sniper Goblins. My advice here is to stay up top, don't drop down to the lower platform until the immediate area is clear. Use cover and grenade throws to create a safe passage through. Repeat this, little by little, and avoid any deaths. Tip: Again, use the jumping technique mentioned in the last section. Simply hide behind a good pillar then double jump vertically, throwing a grenade at the peak of the jump. Repeat as necessary before moving on to another pillar further along. Once your reach the area in front of the warp gate, just as the large group of Vex spawn in, jump up to the higher platform to your right. There's a nice little wall for cover and you can backtrack slightly to avoid direct hits. It's also much easier and more accurate to throw grenades downwards from above. Hop through the warp gate and through the next laser puzzle section. Aim to have at least 15 mins still on the clock at the end of this stage. A larger room awaits next, with three Vex plates that must be activated. Stand on one plate at a time until each one is individually activated. 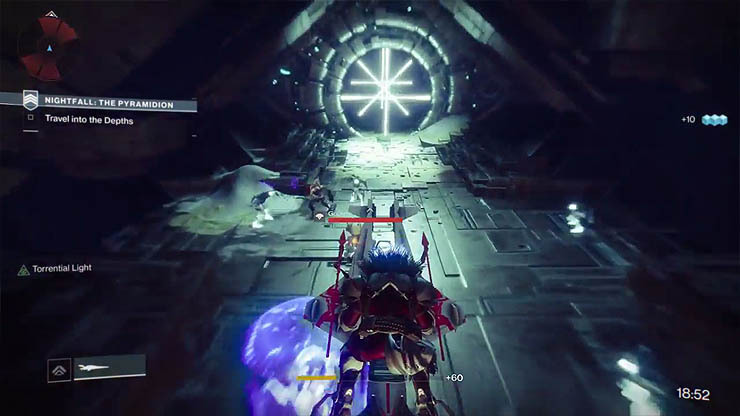 Take your time to clear the room of Taken first before attempting to activate the first altar. The highly annoying Taken Captains throw homing missiles that do some serious damage. Use cover for protection and vertical jumps to gain good accuracy and direction on your grenade throws. More enemies will only spawn when the first Altar is charged so it's possible to activate the first altar and then quickly take the second immediately afterwards before being overrun. Clear the Taken again and take the final Altar to move on. Dash through the warp gate and through the next set of laser puzzles until you reach the "Hack the Network Towers" section. Aim to have at least 11-12 mins remaining at this stage. Only one more section of Taken to go and it's on to the final BOSS fight. This is a larger room with four objectives this time around. Rather than capturing plates it's a simple Ghost scan and a Network Tower is hacked. With this in mind it's possible to buy yourself a small window of opportunity and then hack a tower whilst the Taken are still roaming the vicinity. Remember, once you start the Ghost hack you DO NOT have to stand beside the Tower. The rules are simple here: move steadily from Tower to Tower, using the many pillars and archways as cover, clearing the nearby area and hacking your way through the objectives. Always make it your priority to deal with the snipers on top of pillars first as these are the most annoying and potentially deadly foes. Don't be afraid to use your Super on this section either. 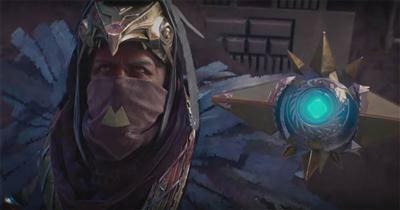 After the fourth and final hack, the objective changes to "Breach the final warp gate" and a mini-boss called "Galk, Gauntlet of Savathun" spawns in front of the gate. Not posing any real threat by himself, a few grenades later and he's easily finished. At the end of this stage you should have around 8 mins on the clock. The final BOSS fight in the Pyramidion is a rather long and drawn out fight - but aren't they all! If you've managed to keep at least 8 mins on the clock then you've bought yourself the luxury of a few deaths. The fight is split into two sections: charging the plates to bring down his shields; and a second phase where he free roams. This second free roaming phase is by far the hardest. During the first phase, stand on the necessary Vex plate to bring down the Genesis' Mind shield and then unleash your strongest attack, in the case of Torrent that's going to be spamming grenades followed by Power Weapons. It's advisable that you try and predict the plate, which is always in one of two spots, left and right of where the Genesis is standing. Enemies will always spawn in front of these plates, providing the chance to place a Barricade for Titan's or take cover behind pillars for other classes. Repeat until the Genesis is down to about half health, at which point he starts to free roam. Save your Super for the second phase where time is more crucial. For the second phase it's a game of cat and mouse. Titan's have a great advantage here and they should place Barricades perpendicular to stone pillars to provide 180 degree protection from Genesis but also the ads which spawn in. Other classes should also use the pillars for protection with Warlocks placing healing Rifts at all times. When the boss rains fire, move to the other side of the pillar if you have space to do so, or take the risky option of finding another pillar close by. If out in the open, use jump to dodge the boss's laser blast which is predictable thanks to its slight delay. Although it's tempting to just continually focus on the BOSS you should aim to clear out the smaller enemies first. Once cleared, additional enemies will NOT spawn in until you've knocked the boss's health down another notch. In the long run this gradual strategy results in fewer overall deaths and constant damage to the boss. With enough patience and good use of cover you should progress through the BOSS fight with time to spare.